Eggs Benedict is a fancy American breakfast dish that will make your breakfast elegant.This dish is very impressive and delicious;mainly consisting of toasted egg muffins,canadian bacon,poached egg and topped with creamy hollandaise sauce.I gave a little twist by using sautéed fingerling potatoes and smoked salmon.Results are amazing! The sauce is very easy to make and comes out perfect every time. Using a blender mix egg yolks,lemon juice,salt and cayenne. Blend for about 20-30 seconds. With blender still working, gradually and slowly add butter. Blend until all butter is well combined. The sauce supposed to be lemony, buttery and lightly salted. I added about 1/4 cup of hot water to make it a little thinner. 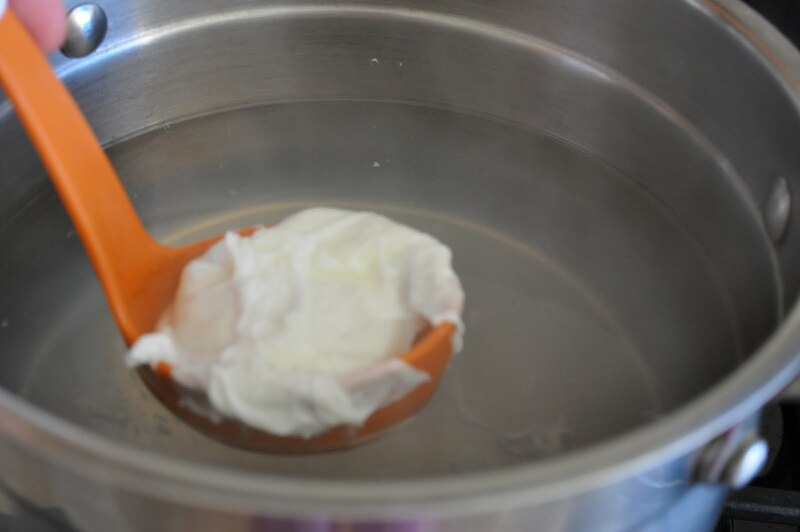 Bring a water to a boil in a medium saucepan or pot.Add vinegar. Turn the heat down to low and add the eggs one at a time.Cook for about 3-4 minutes. Heat oil in a skillet on med-high heat.Season potatoes with salt and add potatoes to the skillet.Sauté until nicely browned. 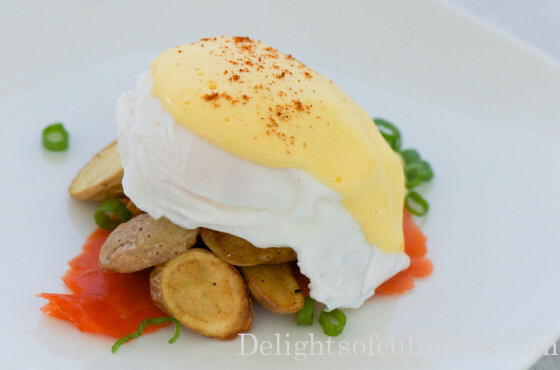 Arrange sliced smoked salmon,canadian bacon or ham and sautéed potatoes on a serving plate.Sprinkle green onions,place egg on top and pour hollandaise sauce over the egg.Sprinkle with cayenne pepper or paprika. Place toasted English muffin on a plate. Sprinkle with onions, and add a slice of smoked salmon. 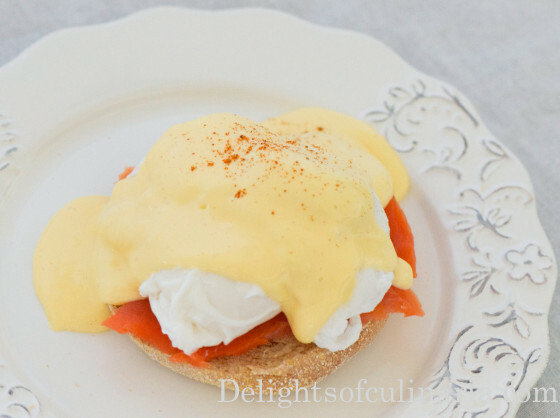 Top it with egg and pour hollandaise sauce over the egg. Sprinkle with cayenne pepper or paprika. Yum! This recipe sounds so amazing !!! Especially with smoked salmon!!! Well, you know it’s probably loaded with tons of goodness. I will have to try making this sauce. However, I did make poached eggs the was you explained it. I never knew that adding vinegar makes the eggs perfectly poached! Thanks for the easy directions.